Women are 36% more likely to be hired than men – but they are also far less likely to view a job and then apply. Men compete more but win less. Our labour market, more so than ever before, is shaped by people moving between jobs. We, therefore, wanted to understand how our members were behaving on movemeon. Having analysed over 20,000 applications, we were fascinated to see some clear trends. Women were not only more likely to be invited to an interview after an application, but they were also then performing better at these interviews. As such, we found that each application made by a woman is 35% more likely to result in a job hire than a man. In this article, we look through the potential causes of these differences at each stage of the hiring cycle (discovering jobs; applications and interviews). Whilst we put forward some solutions, we want this article to be the start of debate – both internally here at movemeon and also externally in the industry. What can we do to address the imbalance in discovery and applications? We looked at the “hiring funnel” for all of these job applications: from viewing a job to applying, to interview, to being hired. Comparing the different conversion rates at each part of this funnel yielded some very interesting results. Not only did women view 20% fewer jobs than men, but they also appeared less likely to apply after viewing a job: on average women would view 25% more jobs before making an application than a man. 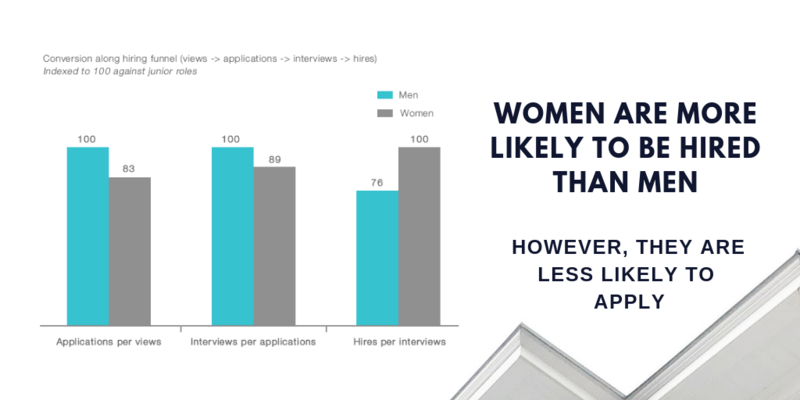 Having made these applications, the conversion to interview was 12% higher for women: in short, their applications were better. Women are also an astounding 24% more likely to be offered a job after having been interviewed. The end result is that after having made an application, women are 36% more likely to land the job than men. In essence, men are competing more but winning less. Casting the net: why do women apply to fewer jobs than men? Before choosing to view a job in full on movemeon, candidates are only able to see the following: salary, industry, function, a hook selling the job, and location. Our first hypothesis is that salary might put women off applying more than men. Men seem to be more open to taking a risk on salary than women, based on our analysis of submitted salary expectations attached to applications. We found that women were asking for only 85% and 92% of the salaries men were expecting in corporate and startup jobs. This may also be true with respect to location, and relevance of skill set vs. new industries and functions. Secondly, it might be that the marketplace has more opportunities that are more popular with men than women (i.e., higher risk start-up jobs, tech jobs and operations functions). These industries have traditionally struggled to attract as many female applications and could be the cause of uneven views of jobs. Finally, might it be that the language in the ‘hook’ lends itself to a male audience? Often the hook is a punchy challenge; an invitation to stretch yourself. If women are, as studies have suggested, less aware of their potential than their male counterparts, it could be that jobs advertisements are systematically written to appeal to the male psyche. I would suggest that similar factors could be at play in the decision to apply for a job from a view. This would have the double effect of decreasing the number of female applications, but also increase the percentage of successful applications. If women do apply when they are surer of a fit with their current skills, they are more likely to be invited to interview. The higher number of views per application also suggests a more measured approach. Women are taking longer to investigate, and therefore both find roles that are a good fit as well as properly tailor applications. As noted earlier, the real difference comes at interview. Women are more 25% more likely than men to be offered a job after an interview. This is a fascinating insight, as traditionally interviews have been seen as an area again contributing to an imbalance in recruitment. Linda McDowell writes in her book Capital Culture: Gender at Work in the City: ‘recruiting is an interesting area to consider in examinations of gender stereotyping as it is at this stage that the particular characteristics and attributes sought in potential employees are made most clear’. Undeniably, at times these expectations still disproportionately favour men. Fundamentally, women are the better candidates at interview. 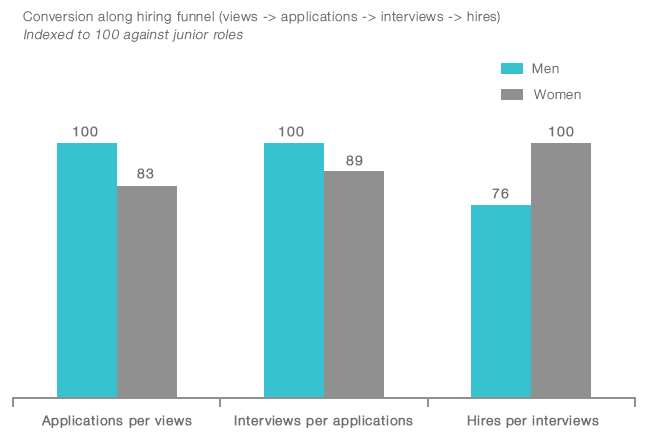 The key driver for this could potentially be the better quality of applications at the initial stage of the hiring funnel: this has flowed through in each step until the decision to hire is made. McKinsey have estimated that adding women to the workforce to the ‘best in region’ levels would add $12 trillion dollars to the global economy. It goes without saying that getting women to parity in the labour market should be a social priority of the highest order because it is unquestionably the right thing to do. As if any more incentive was needed, $12 trillion is a number utterly beyond comprehension. Survey women to get a better understanding of what they are looking for in a new job, and thus in a new job description. Test what actually works: as we always find, adding data helps remove ambiguity. Test different hooks, salaries, etc. and run different ads to A/B test (we’re starting these up at movemeon). Look to take more women through to interview (target a 50:50 short-list for all roles). Our analysis suggests they put higher levels of consideration into applying and are outperforming men at interview!